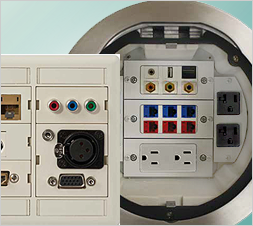 Hubbell Premise Wiring offers cable devices for audio and video wires including horizontal cable management. Audio and video expectations continue to grow as more users engage with multimedia. Hubbell Premise Wiring supports the integration of connections from a variety of audio/video solutions, putting the right connection in the right location in any environment without installation hassle. Install point to point connections over UTP cable with Hubbell's AV 110 Everywhere™ extenders and connectors. Hubbell's High-Definition 110 Video Extender with HDBaseT transmits up to Ultra HD 4K and HDR video signals over one solid, unshielded, twisted-pair (UTP) cable, allowing video display devices to be located a maximum of 328 feet away from a digital source. Today’s business environment relies on the use of multimedia every day. 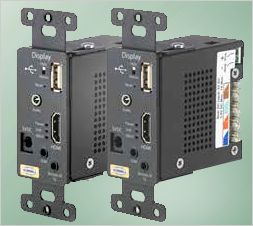 Hubbell’s iSTATION Connectivity products and Delivery Systems solutions are multi-patented product offerings designed to address growing audio video needs.